According to merriam-webster.com, awareness is "having or showing realization, perception, or knowledge", wikipedia.com defines it as "state or quality of being conscious of something", macmillandictionary.com defines it as "knowledge or understanding of a subject, issue, or situation", while dictionary.com simply defines it as "having knowledge". Even when they differ, none of them fully define what awareness is, especially the temporal aspect of it. Given below is the first ever full explanation of awareness which also reveals how it works by revealing its underlying mechanisms. "Awareness is the availability of information or knowledge that is or becomes available to a person either spontaneously or when required"
There are two types of awarenesses, direct awareness and contextual awareness. Direct awareness is based on information provided by senses and perceptions. Such information is linked to what I call "Awareness Buffer" on an ongoing basis. Awareness buffer is an area in the brain containing a set of dynamically updated links to information which can be navigated using the mechanism of attention to bring it to consciousness. The information linked to the awareness buffer is what one is aware of. Contextual awareness is based on information in context with the interaction being considered. In detail: The human brain is full of information stored in the past. It optimizes its ongoing and future interactions by processing them with such information. It is estimated that the human brain can store around 2,500 terabytes of information. Finding and retrieving information similar to ongoing and future interactions at the time of processing them from such a large amount of memory is like finding a grain of sand on a beach - almost impossible. The mechanism of contextual awareness makes such retrieval possible. The following analogy makes it easy to understand how it works. T-shirt analogy: You are in a shop to purchase a t-shirt. You explain the salesman that you want a t-shirt with a pocket. All clothes in the shop are arranged in the racks systematically by their types and sizes. The salesman navigates through the racks and fetches the stock of t-shirts with pockets and spreads them on the table, so you can choose which one to buy. The reason for him fetching the t-shirts is to make your selection process quicker and less cumbersome. That way, you don’t have to go through the entire collection of clothes in the shop. In a similar way, the brain stores information it receives by conceptual hierarchies and links such information by facts, events, perceptions, sensory experiences, emotions, feelings, etc. 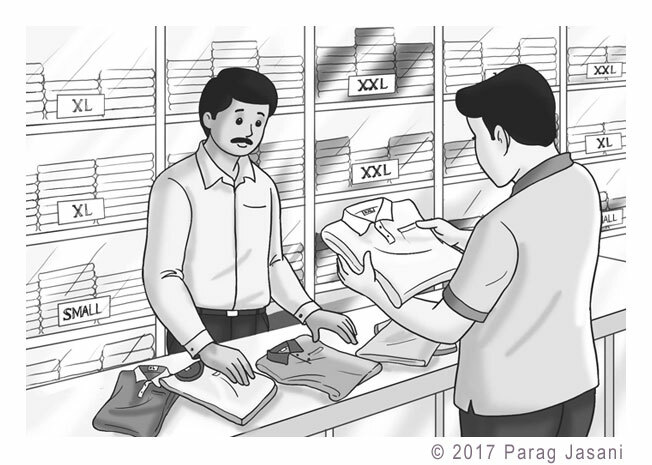 The way the salesman navigates through the racks and fetches t-shirts of your choice and puts them on the table, the brain fetches information relevant to the interaction being considered by navigating such hierarchies and links them to the awareness buffer. Such a mechanism makes it possible to quickly retrieve relevant information from the limited amount of information linked to the awareness buffer instead of the vast amount of information stored in the brain (unlike the t-shirts analogy, the awareness buffer is updated on an ongoing basis). The information linked to the awareness buffer is not limited to stored information. It can also be information gained either by processing stored information, processing information that is being received, or by processing stored information with information that is being received. The mechanism is a result of the optimizing aspect of the evolutionary process. The information mentioned till now can be in the form of sensory information, perception information, knowledge stored in the past or knowledge gained from the thought process.